CSX Transportation has placed two bright orange warning signs in the east and westbound lanes of the Lewis Center Road railroad crossing. The signs warn of next week’s temporary closure of the crossing for maintenance. 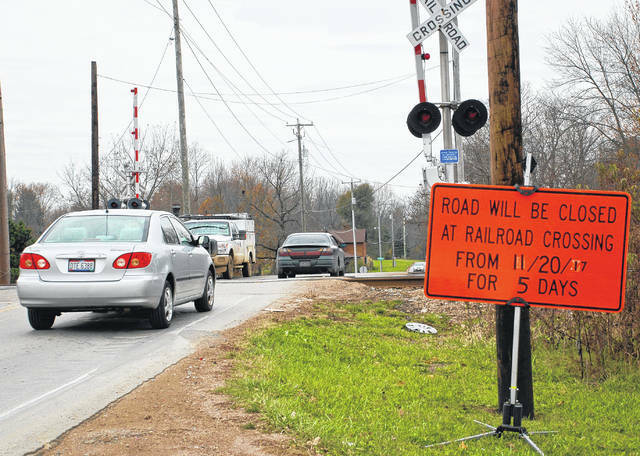 CSX Transportation will close the railroad crossings at Lewis Center Road and Franklin Street in Orange Township for maintenance next week (Nov. 20-24), according to company officials. The following week, Orange Road will be closed for maintenance for six days starting Monday, Nov. 27. CSX has placed bright orange signs on both sides of the crossing warning motorists of the closing. “The residents voiced their concerns to their representatives, the trustees,” said Orange Township Administrator Lee Bodnar. He said area residents informed trustees about their concerns regarding the condition of the crossings during the Oct. 2 township meeting. “The big problem I have is the tracks themselves,” said Ken Schmid, a resident of Center Street in Lewis Center. On the north side of Lewis Center Road, east of the tracks, the new community Evans Farm is being built. Schmid said with the current construction in the area, traffic has doubled or even tripled on Lewis Center Road. Andrea Janka, CSX Transportation spokesperson, said the five-day closing is a “reply to complaints from the city and people about it being a bad crossing.” She said CSX maintenance teams will examine the crossings for any potential problems and make any necessary repairs at that time. Janka said CSX closure of the Franklin Street crossing is being conducted at the request of the Delaware County Engineer’s Office. “The county engineer asked us to close the Franklin Street crossing to keep trucks from driving through the neighborhood,” she said. Bodnar said he has talked with many residents who live in the neighborhood about next week’s work. Bodnar said Norfolk Southern Railway owns the other set of rails passing across Lewis Center Road and Franklin Street. He said the township has been in contact with the transportation company, but was told the request for repairs has come at the end of their maintenance season. Local residents with questions concerning this matter should contact Logan Rector with CSX at 419-453-3166. This entry was tagged CSX Transportation, lewis center, Orange Township. Bookmark the permalink.